Detangling is a necessary evil that naturals endure at every hair length possible. No exceptions to the rule on this one. Everyone has to detangle whether the texture or the thickness or the length of time it takes. It’s one of the biggest challenges that newly naturals face in the beginning that can deter some from staying natural especially if transitioning as the relaxed ends may not need it while the natural roots do! It’s not all bad and in fact detangling can be made easier and quicker with a few tools, products and patience. It’s all about preparation, and trial and error. You try the basics and as you go along you will pick up tips that will aid in making the process and your hair smoother. The tools of the trade are pretty varied according to your liking and your hair, but most naturals start out with the coveted wide tooth comb. There are several types, brands and when you find your favorite, nothing can make you switch! The wide tooth comb is a standard for naturals for two reasons as it can gently detangle and it removes the shed hairs that may get trapped and create more tangles. One popular comb is the Ouidad Double Detangler that is a favorite because it’s perfect for shower detangling and it’s so amazing it was a 2013 Naturallycurly Editor’s choice. That second column of teeth take the comb to the supreme level of effectiveness. This brush is in every natural’s bathroom. A major contender against tangles as it glides through your tresses removing tangles along with shed hairs. It’s also been known to be too rough if not used properly so yanking it through is counterproductive and explains why some have altered it by removing alternate rows of teeth. Once does it’s no longer the Denman brush but the ‘modified Denman’ to lessen the damage of snagging. Despite having a design that most naturals and curlies would run from (some paddle brushes have balls on the end and can snag on your coils) it’s still used and loved by some naturals including some Vloggers. 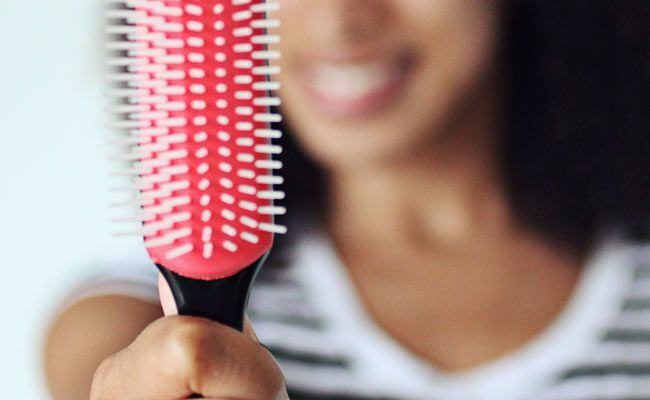 Use with caution as this brush seems more suited for straight hair. When this came out there was so much buzz surrounding it. It made your tangles disappear with flexible teeth and has a unique design. Thought to coax tangles and shed hairs out some have found this to be just the opposite. Either you love it or hate it but you have to admit it’s still quite popular with naturals with its varying sized teeth. The cheapest and the simplest way to remove tangles, finger detangling is loved by many naturals even if they use any of the other tools mentioned. For one plus, you can feel the hair and the tangles which makes it easier to work through. Honestly I never use anything else to comb through my tangles than my fingers and water. Sounds kinda crazy but when combined with a few of the other tools mentioned above water is excellent at removing tangles gently and effectively. The benefits of dry detangling is keeping the hair stretched. If you are not going to wash it and want it stretched for a style then this is a great technique to keep it moving. It’s the quicker method of detangling since you are only trying to detangle and nothing else like washing or having to dry your hair. It can get tricky or damaging if you don’t use enough oil or butter to properly work through the tangles but if you use too much it’s no longer a dry detangling session and can get messy. Portion control is key! Wet detangling is different from damp detangling that the hair is usually soaking or dripping wet. This is usually done in the shower and during the washday. The key to wet detangling is using the water as a means of getting through the hair. I use this method and allow the water to help work out my knots. There is the combination of water and conditioner for a wet detangling session. The problem with this method is wet hair can be fragile so being gentle is necessary and no rushing! Damp detangling seems like the best of both worlds and Neno Naturals breaks it down in the video below. Not soaking wet or bone-dry but just enough for you to work through the hair and have minimal or no breakage. The problem with this technique is you may need more water or the use of a conditioner or oil to properly get through the tangles. This method is not great if you are trying to keep your hair straight since you will see some shrinkage due to adding some moisture to your tresses.